[XPB-RB48] The Rod Commercial Outdoor Metal Bench with Back is constructed with 1/2" Welded steel rod seat and steel metal Legs. Rod Benches are coated in Thermoplastic, a durable weather resistant material, and features pre-drilled mounting holes for easy installation. Available in 16 Color Choices ( see Color Selects). The Rod Bench is available in 4 ft. and 6 ft. Lengths. 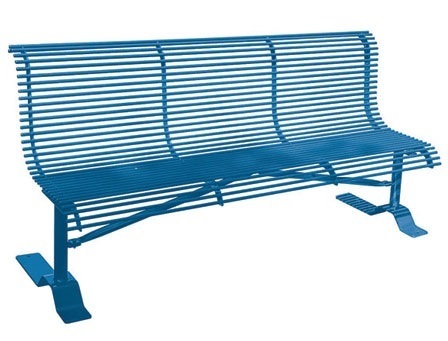 These Heavy duty benches are ideal for parks and as a memorial . Compliment your bench with matching receptacle sold separately. For shipping quotes, discount pricing, orders or questions please call our Customer Service Center at 1-877-483-9270.